This month, I had my blood drawn for an InnerAge test. The results informed me that while I was chronologically 33.9 years old, I was actually 27.4 years old internally -- 6.5 years younger than the calendar claimed! Well, fancy that. 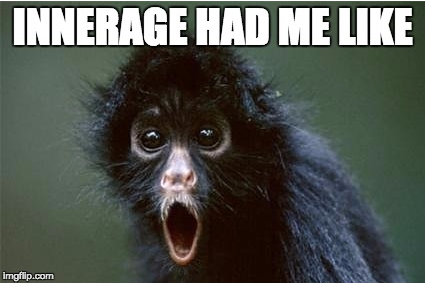 Reaction to my InnerAge results. Seriously. I was 14.5 years older than my chronological age. As we like to say here, “Blood Don’t Lie!” There was no arguing with the numbers. My glucose was elevated; my inflammation marker (hsCRP) was off the charts; my Vitamin D was unimpressive and the only thing which was keeping me from being AARP-eligible in the prime of my life was the fact that my liver enzymes were in excellent shape. The ultimate irony, considering my penchant for late-night techno parties and the occasional glass of vodka. The worst part was that I knew the algorithm was on to something even if the ominous age prediction wasn’t on my driver’s license, because I didn’t look good or feel great either. Despite following what seemed a perfect diet on paper, with elimination of common allergens like gluten, soy, grains and dairy, and no processed foods; despite enough exercise and sunshine; despite meditation and the soothing companionship of my dog -- I still struggled with excess weight, inflammation, water retention, muscle loss and digestive issues. Those things were not improving consistently, no matter what I did. I decided to focus on my Focus Foods. What did I have to lose? Certainly, not any more years. The list of five Focus Foods that InsideTracker provides with each new set of InnerAge results are highly customized, based on biomarker levels, demographic information and preferences. Chia seeds were at the top of my list. I had stopped eating chia seeds nearly a year prior, when I adopted a strict ketogenic diet. I added them back in, along with the other recommendations. I slightly shifted my macronutrient ratios as well, to approximately 40% fat (healthy fats), 35% protein (organic only), 25% carbs (minimal grains). I also shifted to a strict intermittent fasting protocol, which I still adhere to: my first meal of the day is not until around 11am - 12pm. My last meal of the day is by 8pm. I eat less food, less often and am rarely hungry. A bit of a "quantified self" approach, to be sure. I've always had a passion for measuring my own data and for science in general -- particularly the variety that involves exploration. (In fact, last week I was invited to attend the SpaceX rocket launch at NASA's Kennedy Space Center in person, and wrote this piece for TIME Magazine about the experience). My adjustments seem to have made a world of difference. Not much else was changed, aside from the above modifications. The stress of a workplace where I struggled to find fulfillment has been replaced by the joy of work that I now love (thanks, InsideTracker team); surely, that makes a big difference. But one ingredient alone does not make the cake. Each body has different needs that shift over time. This is what has been working for me, at this point in time. Blood is not static. The environment is not static. Life in general is not static. It’s important to realize that what works today, may not be the most optimal approach when circumstances change. Six months ago, at 143 pounds I was about 10 pounds over what I consider to be my ideal healthy weight (2). I know my own body better than what generic clinical ranges suggest, wherein 143 pounds would be considered acceptable. I want to be optimal; not acceptable. After consistently incorporating my personalized Focus Foods, along with the macronutrient shift and intermittent fasting protocol, I lost 9 pounds and am now much closer to my optimal weight. I feel less pain in my joints, my workout endurance is improving, my muscle tone is better, and my biological age has dropped by 20 years. There are still other areas that need improvement, but it’s a great start. While this is not a blog post about the Ultimate Panel, it’s also worth mentioning that on the accompanying Ultimate test I did last month along with InnerAge, I saw that nearly all of my biomarkers have improved since my last test. Improvements on the inside are far more rewarding when we feel them and see them on the outside. You can’t argue with that. 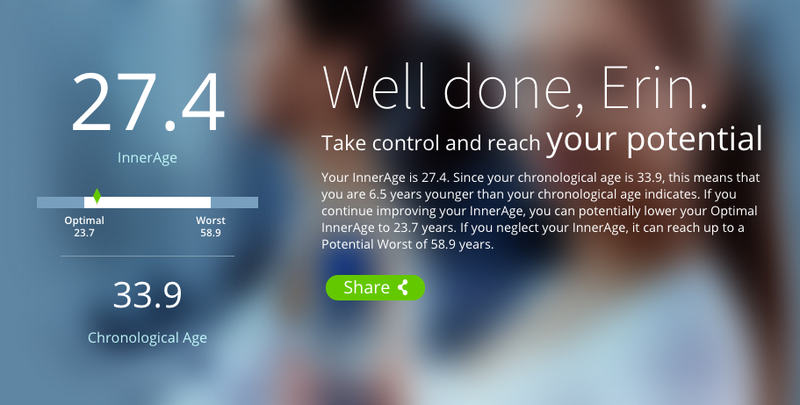 Had my biomarkers and InnerAge improved, but had I felt or seen nothing, I would remain unimpressed. Being lean versus being overweight also matters. Scientific studies show time and again that greater lean body mass is correlated with better health: improved lipid profiles, improved energy and mental acuity, lower inflammation, slower aging, and reduction of countless diseases (3). Did my weight loss improve my biomarkers or did my improved biomarkers aid my weight loss? There’s no solid scientific answer to that question. The fact remains that both weight and biomarkers have improved after implementing InsideTracker's suggested interventions, and I’m happy with that. Plus, being told I'm actually 27.4 years old one week before my 34th birthday sure doesn’t hurt. 1. De Schutter A, Lavie CJ, Kachur S, Patel DA, Milani RV. Body composition and mortality in a large cohort with preserved ejection fraction: untangling the obesity paradox. Mayo Clin Proceedings 2014.